What is the Difference between starches and flours? Both these products started out from the same plant whether it was a brown rice kernel, or a corn kernel or a potato. The flour has gone through a minimal amount of processing and often can be considered a whole grain while the starch is heavily processed to remove everything except …well the starch. The starch is just one step away from being a sugar. Everyone knows that whole wheat bread has more fiber and nutrition than white bread. If there was such a thing as starch wheat bread it would be even further removed. Starches actually contain almost NO nutrition except calories. Most people in North America do not need more starch or calories. Many of the gluten free products contain a LOT of starch. Many of the gluten free recipes you seen online recommend up to 40% starch. Maybe this is why studies have shown that people who follow gluten free diet for some time starch to gain weight compared to their gluten eating comparisons. Check out the figures below. 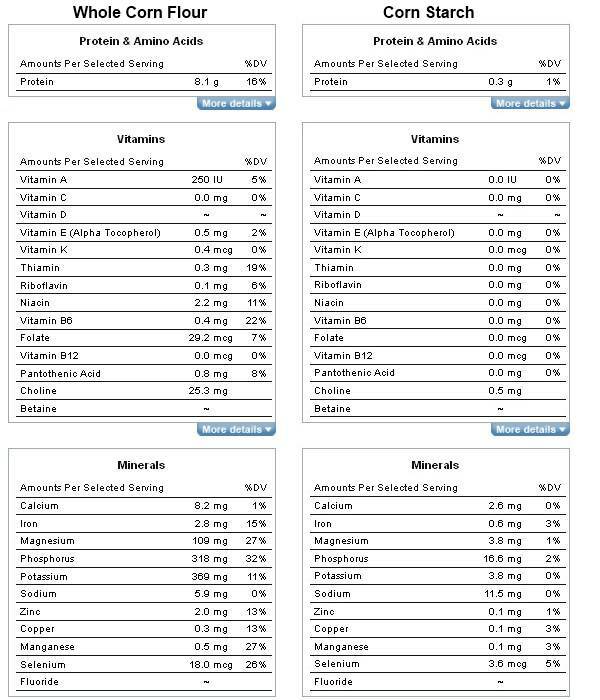 You will see that the starch is just a big list of zeroes when it comes to vitamins and minerals. Notice that corn flour has 16 times the amount of protein, infinitely more of most of the vitamins (since corn starch has ZERO) and many times the amount of the minerals. Not in the picture is the fact that whole corn flour also has several times the amount of fiber, has a much lower glycemic index and causes less inflammation.